Petz Scholtus renovated this gorgeous modern Catalan building into a hotel that offers eco-friendly accommodations in Barcelona. The designer teamed up with hotel management expert Mari Rodriguez and created Yök Casa + Cultura, which opened last summer. 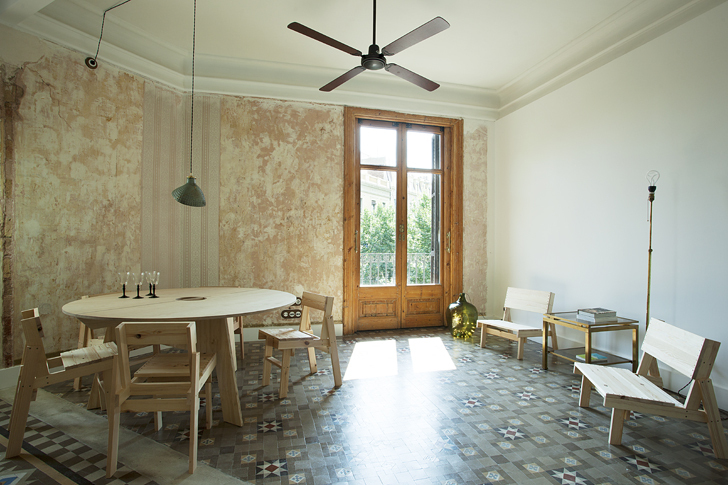 The team combined existing features of Catalan Modernism - like the high decorative ceilings, gorgeous mosaic tiles, beautiful etched glass and amazing wooden sliding balcony doors - with reused, VOC-­free and recyclable materials. The project name “Yök” was inspired by the Catalan word “lloc”, meaning place or location. This echoes the design prinicples that drove the renovation process. Yök taps into sustainable interiors, product and service design as well as local culture and tradition. 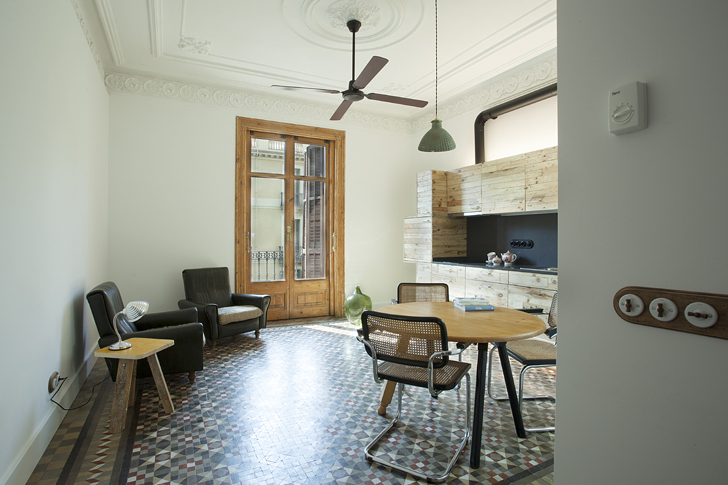 The original building dates back to 1900s and comprised an office space and a rooftop extension from the 70s, which were renovated following eco­design principles and respecting the Catalan Modernism features. The hosts plan to utilize the rooftop terrace and their multi­functional office to organize events for both local guests as well as visitors from abroad. With its slow travel vibe, the space aims to become a a social hub where visitors meet locals and get a chance to avoid the traps of mass tourism. The original building dates back to 1900s. The building used to be an office space and a rooftop extension from the 70s, which were were renovated following eco­design principles and respecting the Catalan Modernism features. This echoes the design prinicples that drove the renovation process. Yök taps into sustainable interior, product and service design as well as local culture and tradition. The hosts plan to utilize the rooftop terrace and their multi­functional office to organize events for both local guests as well as visitors from abroad. The space aims to become a social hub where visitors meet locals and get a chance to avoid the traps of mass tourism. The project name “Yök” was inspired by the Catalan word “lloc”, meaning place or location.